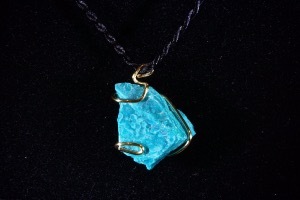 Hand wired by us at London Fossils and Crystals this Chrysocolla is hand wired using a gold plated wire. This pendant will come with a natural hemp cord. 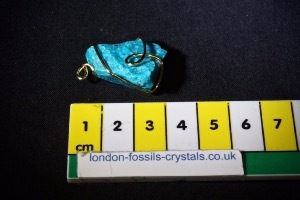 Chrysocolla is a hydrous copper silicate, most frequently the colour is green, blue or blue-green, though impurities can darken it to brown or black. it’s crystal system is amorphous, and it occurs mostly in closely packed aggregates, and sometimes in botryoidal, stalactite, fibrous or earthy forms. Chrysocolla is frequently found in oxidised copper deposits, often in association with Malachite and Azurite. 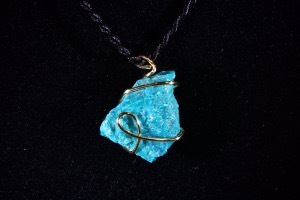 Some Chrysocolla stones also contain Cuprite and these combination stones have their own unique blend of energies. Chrysocolla deposits have been found in Chile, Zaire, Russia and the USA. 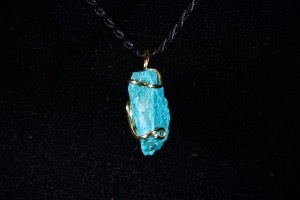 Chrysocolla is said to assist one in owning the value of one’s experiences, knowledge and contribution. It may help one feel more secure when communicating with others and may also help dispel fear in social situations or when one is speaking in a highly charged emotional situation. Physically Chrysocolla is believed to help assist in the release of stress, anxiety and other fear-based imbalances in the body. It may assist in the regulation of the thyroid and adrenals. It considered to be an excellent for sore throats, laryngitis and for support of the larynx in general.